I wonder if they know what happened in Australia?
. 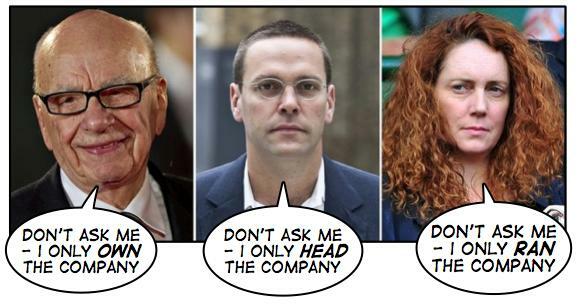 Murdoch controls minds. Yea, sure. Rob has produced his final edition of Inside Canberra. He died yesterday, aged 82, after the sudden final phase of a seven year battle with cancer. 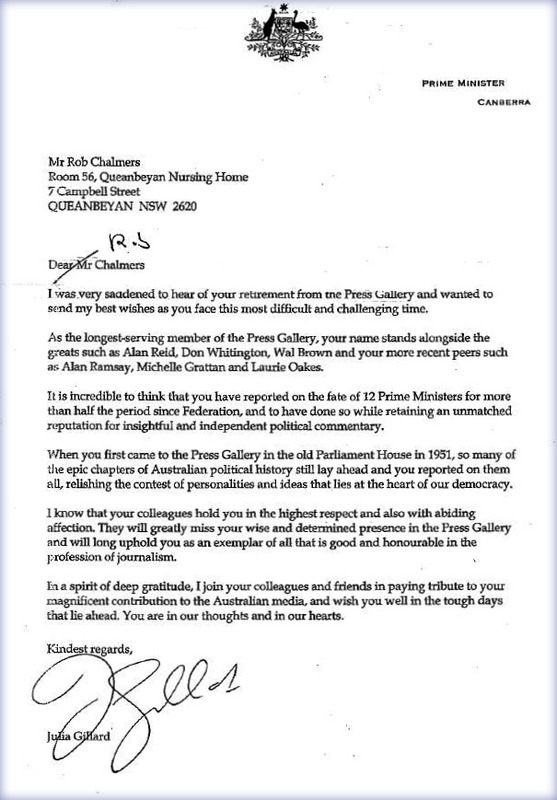 In the press gallery for 60 years, Rob jokingly dismissed Ramsay, Oakes and Grattan as "young pups". Ramsay says "nobody, in an any capacity – politician, bureaucrat or journalist – has equalled what Rob Chalmers somehow endured in the nation’s parliament, from the day he attended his first Question Time on 7 March 1951". Always generous, always interested, and for a time a radio voice I grew up with on 2CH, he has been a part of my life for half his 60 years working in Australia's parliament. Rob and his family can be proud of the life he lived. To listen to Rupert, to listen to his detractors, you’d think he could swing elections. It’s an assumption implicit in the media inquiries likely at both ends of the globe and in the decision Cabinet is about to make on whether to grant his part-owned Sky News the licence to produce Australia’s overseas television service. Its beyond doubt that Rupert has been on the winning side of many elections. In 1972 The Australian gave the Whitlam campaign free advertising space, it editorialised that it was time for a change and Murdoch himself drafted at least one of Whitlam’s campaign speeches. Three years on the paper campaigned so hard for Fraser its journalists went on strike, finding some of what they wrote unrecognisable in the paper that hit the streets. In 1992 after the British Labour opposition promised media laws that would force Murdoch to sell either his share of the satellite broadcaster BSkyB or his newspapers his mass-circulation Sun campaigned against Labour as if its life depended on it. On election day its front page was filled with the face of the Labour leader inside a light bulb. The headline read: "If Kinnock wins today will the last person to leave Britain please turn out the lights". Page three featured a fat woman in a swimsuit under the heading: "Here's how page 3 will look under Kinnock”. The Sun itself claimed credit. It’s headline the next morning read: “It’s the Sun Wot Won It”. Later the Sun switched to Blair after the new Labor leader flew half way round the world to speak at the Murdoch talkfest at Hamilton Island. NewsCorp got to keep its share of BSkyB. But being on the winning side of elections - near consistently - isn’t the same as swinging the result. And it has suited both Murdoch and his critics to act as if it is. What little economic research there has been on the topic suggests that although we take newspapers seriously we are not particularly influenced by them; if anything the influence runs the other way. The most thorough study by Chicago University economists Matthew Gentzkow and Jesse Shapiro categorised American newspapers by the terms they used. Some preferred Republican terms such as “war on terror” and “tax relief”. Others used Democrat terms: “war in Iraq” and “tax break”. Then they examined registered voters postcode by postcode along with circulation figures and found the Democrat leaning newspapers serviced Democrat postcodes while the Republican newspapers serviced Republican postcodes. Checks on church-going (strongly related to politics) suggest it was readers that drove the papers rather than the other way around. Indeed, the more that papers used the language of their readers the more they could charge them. Some owners ran different papers in different cities with different slants. When Australian National University economist Andrew Leigh and Joshua Gans from the Melbourne Business School asked the same questions in Australia he found The Australian and Daily Telegraph somewhat to the right of The Age and Herald Sun (who were tied) with the Sydney Morning Herald further to the left and the Australian Financial Review slightly further left. But the differences were not statistically significant. Only one outlet - ABC TV - was demonstrably different. It lent to the Coalition. Leigh categorised outlets by the type of people they quoted (Helen Hughes vs Robert Hughes) after checking which were quoted with approval by Labor and Coalition members of parliament. Now a Labor member of parliament himself Dr Leigh thinks the study understates the extent to which Murdoch papers back the Coalition. He believes since it was completed in 2004 The Australian has shifted to the right. But he has no evidence, and certainly none that Murdoch papers can swing elections. But Rupert’s Republican-backing United States television network can. In a paper called The Fox News Effect University of California Berkley and Stockholm University economists Stefano DellaVigna and Ethan Kaplan took advantage of the uneven rollout of Fox News across the US in the late 1990s. By the Al Gore – George Bush contest of 2000 some cities had had it for years and some had not. The vote for Bush was 0.4 to 0.7 per cent higher in the towns with Fox News. It appeared to have persuaded 3 to 8 per cent of its viewers to change their vote, enough in that close election to be “decisive”. For me the take-home message is that Murdoch is far from all powerful, as anyone who saw his stumbling, vague performance before the British House of Commons will attest. Newspaper readers are extremely good at making up their own minds about what they read and reading more widely where needed. Reading isn’t a passive activity. Writing doesn’t shape minds. But television and radio are different. Andrew Leigh’s study finds commercial radio and TV stations far more extreme in supporting the Coalition than either newspapers or the ABC (although the result is not statistically significant because of the small number of times radio stations quoted public figures on his list). Since then it is clear to anyone listening that radio has become more extreme. On climate change in particular one set of views prevails, especially in Sydney. And because radio is a broadcasting rather than an interactive medium that dominant view is taking hold. Gillard is getting slaughtered in the media, but not by the press. It's hard to fight back against a medium that caters for people who don’t read. Murdoch is the least of her problems.
. 2007 column: Can media proprietors such as Rupert Murdoch swing elections? Lateral thinking. What to do about the US debt ceiling. The Treasury's lawyers should simply announce at 9 am Monday morning that (a) since the Constitution prohibits questioning the validity of the national debt, and (b) since the continuing resolution that mandates spending through September 30 was passed later in time than the restriction on borrowing, that (c) the debt ceiling is a dead letter. This is so by the oldest of the principles of black-letter law: a law inconsistent with a previous law is deemed to repeal the previous law even if it does not do so explicitly. An administration that can find lawyers to say that Libya is not "hostilities" and that wanted to reassure markets and reduce economic uncertainty by solving the debt ceiling kabuki theatre debate would have no problem at all with finding lawyers to advance and justify this well-grounded and wise legal interpretation.
. The Constitution forbids me from even thinking about default.
. You ordered me to spend.
. A previous Congress told me not to borrow, but no Congress can bind its successors, and those of you who are in this Congress here now ordered me to spend.
. I'm just doing what you told me to do--and what the Constitution directly and explicitly tells me to do. And then we should move on to the people's business. This episode of kabuki theatre has done nobody any credit. If I had previously had any respect for or confidence in Republicans, this would have shredded it. And each day it continues it further shreds my respect for and confidence in the executive branch. What needs to be done is for the Democrats in the Senate to present a plain vanilla bill that simply raises the debt limit and NOTHING more. No more wheeling, no more dealing, no more offers hoping for counter-offers that are never ever offered. In other words all the Dems need do is invite their opponents to show their hand. Are they or are they not willing to raise the debt limit? That's ALL that's needed, just that one simple bill. It should have no trouble passing in the Senate, since the Dems have the majority and no Republican in his right mind would dare risk being held responsible for economic catastrophe by filibustering. Once the bill is passed it's handed over to the House, which will be a moment of truth for the Tea Party. As I see it, there's no question as to the outcome. They will fold. Wonderful, you say? Not really. Because the Democrats are in total disarray. It's unlikely any of them can see clearly enough to offer up the simplest and most effective solution. After all their failed attempts they will most likely go down to the wire with one lame offer after another, which is exactly what their opponents expect. Holding NO cards at all, the Republicans will continue to bluff, offering nothing in return ever. If the Democrats then hold out, and they might, the "disaster" will be upon us. Checks won't get mailed, the markets will tumble and -- just as with the TARP -- congress will have "second thoughts," the Democrats will act "responsibly" (what a laugh) and totally capitulate to all Republican demands. At that point, the debt limit will get raised. And that will be the death of the Democratic Party. Access Economics has dismissed talk of economic weakness and interest rate cuts forecasting robust economic growth of 3.1 to 3.5 per cent for years to come. But the firm says almost all of the growth will be in two sectors: mining and mining-related construction. The July Reserve Bank board minutes released Tuesday say the June quarter inflation figure to be released Wednesday will be “important in helping to shape views about inflation, and therefore the future path of interest rates”. The median forecast of the 22 economists surveyed by Reuters is for a high headline annual rate of 3.8 per cent, masking a slight fall in the underlying rate to 0.7 per cent for the quarter. I'd feel ashamed. They feel proud. Senior government ministers have blasted new anti carbon tax television advertisements as “factually incorrect” and an attempt talk down the economy. The multi-million dollar industry-funded campaign claims that in just over six years Europe’s carbon pricing scheme has raised $4.9 billion. 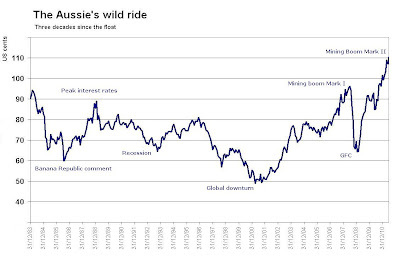 Over six or so years Australia’s will raise $71 billion. Labelling the claim “deceitful” climate change minister Greg Combet said the ads excluded free permits from the European calculation but included them in the Australian calculation. “It's completely misrepresentative. These are fundamentally Liberal Party ads. The Australian Chamber of Commerce and Industry which is the leading organisation behind these ads has historically had a close association with the Liberal Party,” he said. Until the election of the Rudd government the chamber was headed by former senior Coalition staffer Peter Hendy who rejoined the Coalition on leaving the chamber. Mr Evans referred questions about the claims made in the advertisements to Minerals Council deputy director Brendan Pearson who confirmed the Australian calculation included the cost of free permits whereas the European calculation did not. Because free permits are not auctioned the European figure excludes revenue included in the Australian calculation. When asked whether it was valid to compare income over the past six years in one region with income over the next six years in another Mr Pearson said it was. Speaking from North Queensland where he was inspecting coal export facilities set to double their traffic in five years Treasurer Wayne Swan attacked “well-funded vested interests trying to talk down the future of our economy”. 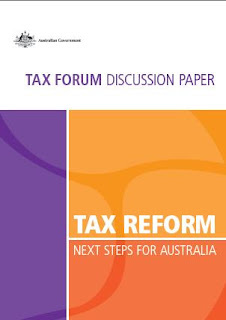 An Access Economics report released this morning said the impact of the carbon tax “may well be rather smaller than the huge headlines would have it”. “Indeed if the government succeeds in generating greater certainty, that could even unlock investment potential in a range of industries, particularly utilities,” Access director Chris Richardson said. Malcolm's speech: "If Margaret Thatcher took climate change seriously..."
The Great Barrier Reef is brutally confronted, it is indeed in the front line of the climate change battle, by two aspects of global warming. Most of the warming which is the consequence of human carbon dioxide emissions increasing the greenhouse effect has been absorbed in the ocean. That’s no surprise. As ocean temperatures rise, coral bleaching, which is another way of saying coral dying, events have increased. Indeed since 1979 there have been eight mass bleaching events on the Reef with no known bleaching events prior to that date. Furthermore as more carbon dioxide is absorbed into the ocean it increase the acidity of the ocean – the last time the ocean’s acidity was this high was 25 million years ago. This is reducing the capacity of hard shelled sea creatures to form their calciferous shells – whether they are krill in the Antarctic or coral in the tropics. Much of the work that was done by Virginia and her team, many of whom are here tonight, and which continues at GBRMPA was to reduce agricultural run-off into the Reef, reduce unsustainable fishing on the Reef, and was all designed to increase its resilience to deal with these larger, long term existential threats. Just as a healthy person can better battle a disease, so can a healthier Reef better respond to, and at least in part adapt to, the consequences of climate change. Now, you will be relieved to know I am not going to spoil the evening with another political speech about the carbon tax or Julia Gillard’s broken promise not to introduce it. Rather, I wanted to say something to you about the importance of science. And let us not forget it was Margaret Thatcher who in 1990 committed Great Britain to reducing emissions by 2005 to a level no greater than 1990 and who as that commitment to combating climate change committed £100 million to sustainable tropical forestry. So so much for those who suggest that people in the Liberal Party or on the centre-right of politics more generally who support effective action on global warming are some how or another from the left. If Margaret Thatcher took climate change seriously and believed we should take action to reduce global greenhouse emissions, then taking action and supporting and accepting the science can hardly be the mark of insipient Bolshevism. Nonetheless, there is no doubt that many people are grounding their opposition to the Gillard Government’s carbon tax on the basis that climate change is not real and that the scientific consensus which supports it is not soundly based. It is important to remember however that the rejection of the consensus scientific position on global warming, rejection of the CSIRO’s position on global warming, is not Liberal Party policy. Quite the contrary. The Liberal Party’s policy is to accept the scientific consensus that the globe is warming and that human greenhouse gas emissions are substantially the cause of it. It is also the Liberal Party’s policy to take action to cut Australia’s greenhouse gas emissions such that by 2020 they will be at a level equal to 95% of their level in 2000. This is the same unconditional target adopted by the Rudd Government and the Gillard Government and pledged at Copenhagen. That 5 per cent cut is not expected to single-handedly stop global warming but is a measured and prudent contribution to what needs to be a global effort to reduce greenhouse gas emissions so as to prevent, it is hoped, temperature rises beyond 2 degrees Celsius in the course of this century. Having said that, it is undoubtedly correct that there has been a very effective campaign against the science of climate change by those opposed to taking action to cut emissions – many because it is not in their own financial interests – and that this has played into the carbon tax debate. Normally, in our consideration of scientific issues we rely on expert advice. Agencies like the CSIRO or the Australian Academy of Science are listened to with respect. Yet on this issue there appears to be a licence to reject our best scientists, both here and abroad, and rely instead on much less reliable views. Some of those less reliable views are from scientists – although most are not. In an age where the Internet gives everyone the opportunity to be a broadcaster, you can find an opinion to support any proposition. If it doesn’t suit your interests to reduce the use of fossil fuels, there are plenty of blogs and articles online to support your self interest. Some of this material online can be very embarrassing to rely on. A good friend of mine recently contended that the CSIRO were utterly wrong on climate change and he sent me a paper from what he understood was “a leading scientist in a leading journal”. As it turned out the paper was in journal published by the Lyndon LaRouche Movement and was written by a man who had recently served time in gaol for securities fraud. The only peer review to which his work had been subjected was, in fact, a criminal jury. I might note for those unfamiliar with it, that the local wing of the LaRouche movement is the Citizens’ Electoral Council (CEC) an extreme, rightwing, racist organisation that I’m proud to say that the Liberal Party emphatically and invariably puts absolutely last in any how-to-vote form that we distribute. These are the charming people who recently disrupted a scientific conference in Melbourne by threatening Professor Hans Schellnhuber, a leading European climate scientist in the midst of his lecture by waving a noose in front of his face and saying “Welcome to Australia”. Just think about that. What a wonderful welcome to Australia from these people. Now my friend had spent much of his career drawing on expert advice in business, economics and science. He goes to the best consulting firms for his advice, the best law firm, the best accounting firm. And yet on a subject as important as climate change he has been taken in that was anything but the best. And needless to say he was a little bit embarrassed by it. But this is not an isolated case. And I have to say this is like ignoring the advice of your doctor to give up smoking and lose 10 kilos on the basis that somebody down the pub told you their uncle Ernie ate three pies a day and smoked a packet of cigarettes and lived to 95. Now that is how stupid it is and we have to get real about supporting and responsibly accepting the science. And if we want to challenge the science, do so on the basis of peer reviewed work of which I have to say, there isn’t a lot on the contrary side of the argument. And this is actually — this war on science and on scientists which is being conducted is much worse than the case of person who ignores his doctor’s advice and follows the advice of his friend down the pub, drawing on the life experience of the fortunate Uncle Ernie. Because the consequences of getting our response to climate change wrong will not likely be felt too severely by us, or at least not most of us, but will be felt painfully and cruelly by the generations ahead of us. And the people in the world who will suffer the most cruelly will be the poorest and the people who have contributed the least to the problem. There is an enormous injustice here. When people try and suggest to you that climate change is not a moral issue, they are wrong. It is an intensely moral issue raising grave moral issues. Those of us who do not believe the CSIRO is part of an international Green conspiracy to undermine Western civilisation or do not believe that leading scientists like Will Steffen are subversives should not be afraid to speak out, and loudly, on behalf of our scientists and our science. We must not allow ourselves to be deluded on this issue. If you are a Liberal, as I and many others here in this room are, most of us are perhaps. If you are a Liberal, do not imagine that taking that position puts you at odds with Liberal policy – it does not. It does not. And remember too that if we form a Government in Canberra and then seek to meet that 5 per cent target through purchases of carbon offsets from farmers and payments to polluting industry to cut their emissions, the opponents of the science of climate change will be criticising that expenditure too as “pointless” and “wasteful” with as much vehemence as they are currently denouncing Julia Gillard’s carbon tax. As Liberals, we have to stake our environmental case and our position on the right way to deal with climate change on the basis that we are supporting the science. That is our policy and we should not allow ourselves to allow people to imagine that it is not. In my view, we cannot afford to allow the science to become a partisan issue as it is in the United States where it appears that it is apparently no longer politically acceptable for any would-be Republican Presidential candidate to say that he or she believes that global warming is occurring and is caused by human activities. Now the change in the Republican Party is extraordinary. In the Presidential Election in 2008, John McCain, the Republican candidate, ran on a policy in terms of climate change that was only marginally different to that of Barack Obama. I mean, the differences were one of detail. And there has been an extraordinary swing, not against cap-and-trade versus direct action; not against one mitigation policy against another; but there has been a swing against the science and that is profoundly dangerous. Because we run the risk that we diminish the science, that we discredit the science and that of course is the ultimate justification for doing nothing about it. Now not so long ago I was with a friend, a very long serving and distinguished Environment Minister from our region and we discussed the progress of the climate change issue globally. And he said that he thought that human selfishness and greed was so great that there would no effective action to reduce greenhouse gas emissions and that by the end of the century our planet would be uninhabitable for billions for people. And as he said that, I felt a chill going down my spine. I feared that he was right but my natural optimism reasserted itself and I thought to myself, ‘we are better than that’. We are better than that but you could not fault him in terms of his objectivity or realism. Now let me just say this to you: The idea that our country, this great country of ours, can sail through a 3, 4 or 5 or more degrees rise in temperature this century with our prosperity and freedom, let alone the Great Barrier Reef, intact is very naïve. So this is a big issue. So in the storm of this debate about carbon tax and direct action and what the right approach to climate change should be, do not fall into the trap of abandoning the science. Do not fall into the trap of thinking that what Lord Monckton says or what some website says is superior to what our leading scientists or leading universities would say. And I just ask all of you, many of you here, have had important dealings with the medical profession. Would you allow yourself, your own body to be operated on by some medical theory that you picked up on the website or would you seek to get the most highly respected specialist in the field to operate on you. We all know what the answer is. That’s what we do with our own bodies. What we’re talking about now is the future and the health of the planet. Now I think an effective response to climate change does not depend on one mitigation policy or another being adopted. Different countries will have different views on what is the most cost-effective way to reduce and indeed so will different political parties and different political leaders. But we must not allow opposition to a particular policy to undermine or diminish our commitment to take climate change seriously and to work effectively both here and globally to ward off the avoidable consequences of global warming. We also need to be very clear-eyed about what an effective global response to climate change requires. There are many calculations on the scale of emissions reductions required. 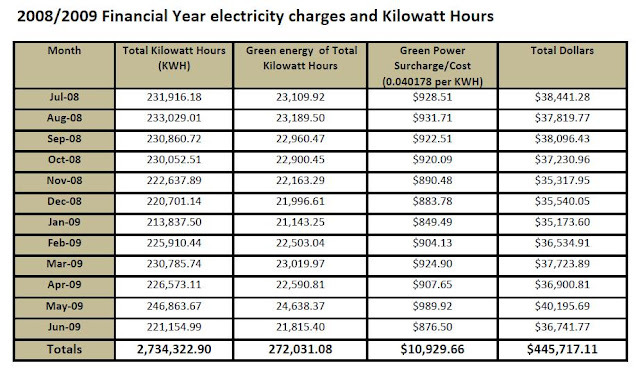 But it is quite clear that to achieve the necessary cuts by mid century all or almost all of our stationary energy – and when I say our, I mean the world’s – will need to be generated from zero or near zero emission sources. This could be renewables like hydro, biomass, wind, solar or tidal power. It could be geothermal power, it could indeed be nuclear power. But it will not be burning coal unless the emissions from that coal are captured in some form or other. Australia generates most of its electricity from burning coal – much of it very emissions intensive brown coal in Victoria or South Australia. That is why our carbon dioxide emissions are among the highest in the world on a per capita basis – a reason why the Chinese (whose emissions are about one-fifth of ours) and the Indians (whose are less than one-tenth of ours) find our regular references to their emissions – and why should we do anything until the Chinese or Indians do something – why they find those references incredibly galling. Those of us, and David’s a member of this club with me, who have represented Australia at international conferences on this, know how incredibly embarrassing statements like that are when you actually confront the representatives of those countries. We are also the world’s largest coal exporter – we have 19% and 58% of the global trade in thermal and metallurgical coal respectively. In 2009, thermal coal exports were worth $18 billion, and metallurgical coal exports worth $40 billion. Some people would say, I trust that most would not, that as we have a vested interest in coal being burned we should oppose action on climate change and rather like the tobacco companies who sought to discredit the connection between smoking and lung cancer muddy the waters on climate science in order to prolong the export billions from coal mining. Others might say that we should not be troubled by the long term prospects for coal because we have abundant resources of the alternatives – gas, the least emissions intensive fossil fuel, uranium, geothermal power and, of course, plenty of sunshine. A more responsible approach would be to encourage the development of those alternatives at the same time as we promote and develop technologies to capture CO2 emissions from coal burning – whether that is by pumping it into the ground or by turning it into other useful products. Indeed many would say that no country has a greater vested interest in clean coal than Australia. And yet I regret to say to you that neither the Labor government led by Julia Gillard – who is a woman fond of a hard hat, I must say – nor the coal industry itself have shown much enthusiasm for investing in Research and Development or trials for Carbon Capture and Storage. 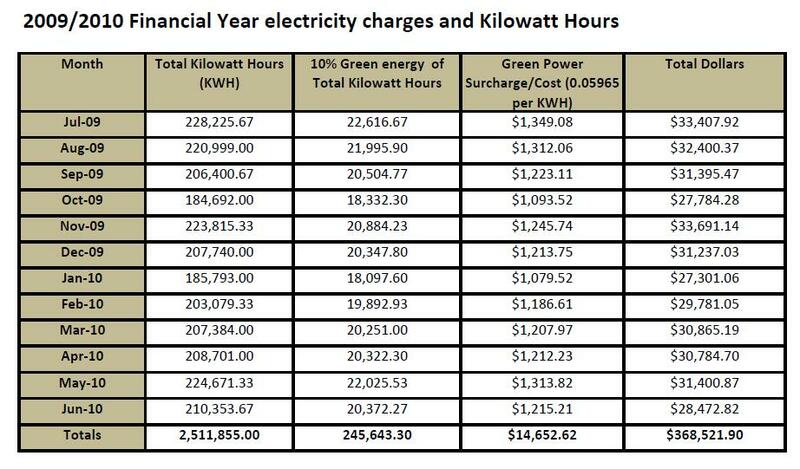 In fact funding has been cut again as part of the recent carbon tax package. A handful of large firms dominate production of thermal coal and coking coal. BHP, Peabody, Rio Tinto, Anglo-American, Xstrata, Wesfarmers. The operating earnings generated from thermal coal production alone are not easy to estimate, but they may approach $10 billion in good years. There is plenty at stake at both the level of producers and export earners, not to mention the taxes they pay along the way for there to be a critical mass of parties with the motivation and resources to move on carbon capture and storage. Now one of the most dispiriting parts of Professor Garnaut’s updates was his analysis in volume seven on carbon capture and storage. Essentially he said work had come to a halt in 2008 and no technical progress or commercial pilots of significance were apparent. The estimate of coal capture and storage adding 40-plus per cent to the cost of coal-fired electricity was about the freshest fact on the page. One need only look at the vast expansion of new investment in coal-fired generation underway in China, India and elsewhere to understand the importance of this issue. Carbon Capture and Storage isn’t just about saving Australia coal exports or generation capacity. It is about addressing the reality which the MIT study on the future of coal baldly stated as long ago in 2007: “We believe that coal use will increase under any foreseeable scenario because it is cheap and abundant.” Now if it increases and emissions increase and the science is right, the Reef is finished. And that is a very small part of it. So this is a very serious issue and it is remarkable that with all the rhetoric about the need for action from the Gillard Government, the single most important area of research and development, the one that is arguably the most important in terms of the world’s future and most certainly most important from the point of view from our own economy, is being neglected. So the commercial feasibility and large-scale deployment for Carbon Capture and Storage is the only way – in the absence of some great technological shift, and you won’t find me discounting that, I’m a great believer in the disruptive power of technology – the world has any chance whatsoever of achieving the cuts needed to get to the 60 per cent or 80 per cent 2050 targets that leaders have committed to. The thermal coal industry and the Gillard government both know this. So how should Australians interpret their disinterest in this technology? As an acknowledgement that Carbon Capture and Storage doesn’t work and is too expensive and hence thermal coal is finished? Or a sign they don’t ever expect to be answerable for those 2050 targets? I fear that is probably the answer.
. The Coalition plans to install 273 solar panels per day. Really. I would love to see one for Australia. 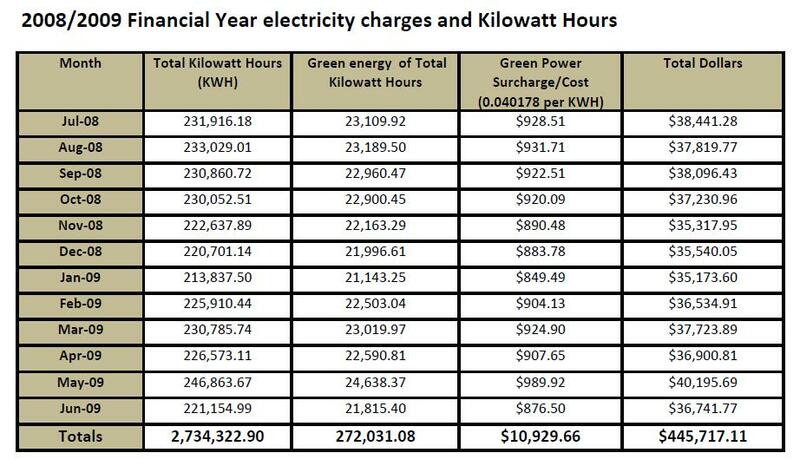 The figures show Treasury uses green power and has cut its electricity use..
Part of it would be quieter times after the GFC. Treasury burnt a lot of midnight oil during 2008/09.
. How would the Treasury analyse the NBN? This Symposium has asked, ‘Is Public Policy Getting the Economics it Deserves?’ The answer that is implicitly presumed is (surely) “No”. But we are missing the point if we think that the frank badness of policy in contemporary Australia is sufficient for the answer. For the question is directing us - not to whether policy is good or bad – but how much good could economics do for policy; what is the most that policy could get out economics? And how might that ‘most’ be realized? Briefly, how is economics to be turned to good effect? Here I will part from many in our assembly, and assert that this vision of the economist as the expert is badly wrong. First, economists simply don’t have the grip on the quantitatively calibrated counterfactuals that are requisite for any reliable repertoire of remedies. What economists know is highly conditioned, ‘partial’ propositions ,that freeze the operation of most of the economy by ‘ceteris paribus’ clauses. To put it another way, economists can shine a lamp on some parts of the economic machine, but most of the machine, in all its baroque intricacy, is wrapped in gloom. Thus all attempts to predict the response of the machine are fraught. Our difficulty in predicting this machine is compounded by the fact that economic system is integrated a still more mysterious political- economic system. These ‘general equilibrium’ behaviors of this system will mock any aspirations to control it. Economists can correctly distinguish things, they can rightly say what they are, and what they will become. (‘this is cost; this is a burden; this is a waste’). In medical terms, economists’ knowledge is diagnostic and prognostic, but not therapeutic. So where does this leave the usefulness of economists? First, let’s grant that prognosis and diagnosis, even the absence of therapy, are not wholly ‘useless’. Second, even in the matter of therapy, there is a usefulness of the Socratean wisdom that we know that we don’t know. Economists, in other words, can be useful in the way medicine was most useful before the 19th century; by discrediting quacks, and the false and destructive hopes of their quack remedies. But despite these two uses, the position I have outlined above appears to imply a quietism that is extreme and intolerable. Is there really no failure (either government failure or market failure) that is so egregious that economists cannot claim to know of some action that would be improving? To put the point more concretely, is there is no policy that so idiotic that economists cannot be said to know that its abolition will be for the good? Here I have to concede; of course, there are such egregious failures, of course there are such idiotic policies. But I concede without inconsistency, because the kind of cases which irresistibly illustrate those egregious failures are ‘local’ in domain (rather than macroeconomic or ‘paneconomic’ in domain) so that the general system effects that mock our aspirations to control can be safely ignored. So, yes: with such local egregious failures let’s identify them, deplore them, and crave their disappearance. Let’s do all this, quite sensibly, in the role of the social critic. But let’s not do this in the expectation that what we have to say will absorbed as ‘advice’. For there is a second deficiency in the vision of ‘economist as dentist’. That vision assumes a dyadic relation: dentist and patient. But in the matter of policy advice the critical relation is (at least) tripartite; the public, economists, power elites. The critical point is that our power elites so ‘impoverished in consciousness’ there is incoherence in expecting our knowledge to be heeded. It is a bit like recommending to a lunatic Benjamin Franklinesque precepts of rational self-management. Or explaining to a thief the benefits to all of everyone observing an honesty box system. There is an incoherence here; if the advice was ever going to be listened to it, wouldn’t be needed in the first place. I conclude that to hopefully advance our knowledge as ‘advice’ is a bit late in the day; it is trying to dispose of symptoms without dealing with the pathology. We have to go back a bit, or a bit further down. In that respect I will not pin any hopes on formal economics education; we have plenty of that, and what good has it done us? It is a sobering, even melancholy, exercise to enumerate the MPs with formal economics education in the current federal parliament. It is not the fewness that depresses, but the very number, and the particular individuals who can make the claim. What the political elite is needs is not the drilling in some abstract curriculum, but ‘enculturation’ or even ‘socialization’. So I will conclude by exploring the suggestion that economics can makes it useful through economists constituting a socialising weather system in an otherwise hostile climate. Socialization is a thing done in informal groups; it is not something that happens to you by reading a book, or by undertaking a qualification. It is often seen as a hierarchical process (from old to young), but has important elements of mutuality. Think of economists, then, as comprising a group, with a degree of hierarchy (or gradient); at the apex are performers, descending to audience, and then to mere onlookers and passers by. The performances of the performers span the written word, the spoken word audience, the Facebook micro blog and the Twitter tweet. The audience and onlooker receive an impress from these performances. But at the same time the performer is also receives an impress from the reaction of the audience, and even from passers by. There is also a dynamism; there is a percolation inwards as some of the audience join the performers. More importantly, there is a dynamic in the opposite direction, as the passersby pass by, and soak into the wider world bearing their impress; and so silently and tacitly shape the ways of the wider world, and enrich that impoverished consciousness. The ‘group’ in the above scenario is obviously not an arbitrary aggregate of individuals, but a community. The Economic Society of Australia is the leading example of such a community, and today’s Symposium exemplifies the process I have hopefully described. Carbon Tax. When we Google, we are more interested than concerned. We might be angry about the carbon tax at Tony Abbott’s public meetings, but on the internet we don’t seem to mind. Google has taken the unusual step of releasing details of the exact terms used in web searches related to the tax in the days immediately following Julia Gillard’s announcement. Of the 16 most-asked questions none suggest resentment. The most popular were: “what is carbon tax,” “what is the carbon tax,” “how will the carbon tax affect me” and “what is the carbon tax and how does it work”. 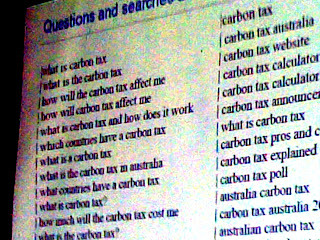 Of the 17 most-entered search terms not phrased as questions only the least popular, “no carbon tax” suggests anger. The most popular were the more straightforward “carbon tax,” “carbon tax Australia,” “carbon tax website” and “carbon tax explained. 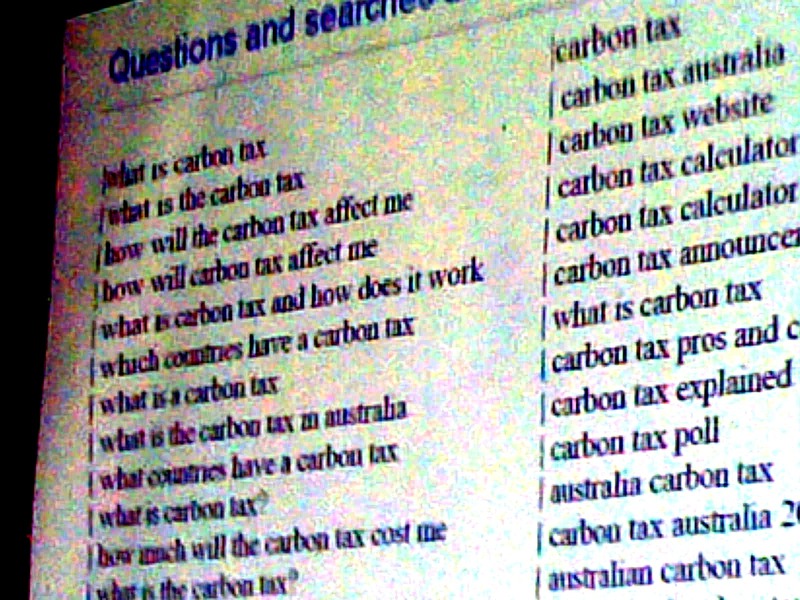 Displaying on a screen what he said was normally internal Google data the firm’s US-based chief economist Hal Varian told a policy forum in Canberra governments might one day be able to use such information to know instantly the questions the public wanted answered and where their concerns lay. The search queries paint a picture of a nation hungry for information but far from alarmed. The most interest was in the Australian Capital Territory, home of the government and public servants, followed by Tasmania. The least interested Australians lived in NSW, Victoria and Western Australia, devoting half as much web search time per person to the carbon tax. The forum declared so-called “direct action” approaches to fighting climate change the runner up in the annual Economic Society of Australia Dodgy Awards for the worst use of or most callous disregard for economic research. Judged by former Competition and Consumer Commission Chairman Alan Fels on the strength of boos and cat calls after a series of presentations, the most dodgy project was declared to be the national broadband network, on account of both the paucity of economic analysis supporting it and its cost. consumer spending in 2011 from 2.6% to 1.2% and for 2012 from 2.8% to 2%. in 2011 and from 4.5% to 2.7% in 2012. We have not made material adjustments to our expected profile for the AUD. We already expect an 8–10 big figure fall in the AUD through to mid 2012.
been priced into the market . less important than our global growth view and the outlook for the USD. 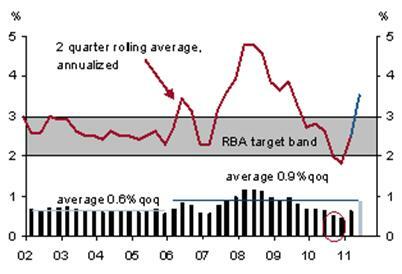 have been if the RBA were easing unilaterally." Tony Abbott has copped blame from the government for a new dive in consumer confidence which has pushed it to depths not seen since the global financial crisis. The Westpac Melbourne Institute index dived 8 per cent in the survey conducted just ahead of the weekend carbon tax announcement, one of the biggest monthly slides on record. Pessimists now outnumber optimists 7 per cent; the widest gap in 26 months. The survey shows confidence among Coalition voters at an unusual low of 79 points, meaning pessimists outweigh optimists 21 per cent. Confidence among Laobr voters slipped 5 per cent but they remained on balance positive with optimists outweighing pessimists 14 per cent. Mr Evans said uncertainty about the introduction of a price on carbon was undermining confidence along with the European financial crisis and the lingering impact of rate hikes. Mr Swan said uncertainty about events in Europe would have weighed on consumers as well as sombre news from the United States. 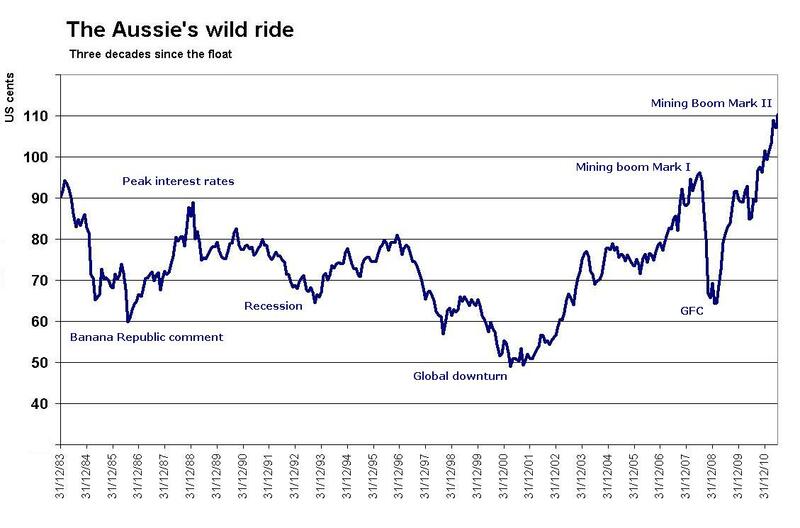 “But I also think for the sake of Australian business, both small and large, Mr Abbott needs to stop talking down the Australian economy and stop scaring Australian consumers,” he said. Mr Abbott said the carbon tax itself was sapping confidence and the prime minister should call an election. Asked to describe family finances now versus a year ago pessimists outnumbered optimists 26 per cent. Asked about finances in the twelve months ahead time pessimists prevailed 8 per cent. Only when asked whether now was a good time to buy a major household item did optimists prevail, outnumbering pessimists a 25 per cent. Separate Treasury figures released yesterday showed wealth held as property, shares and related assets little changed at record highs. On average each Australian family owned assets worth $759,300.